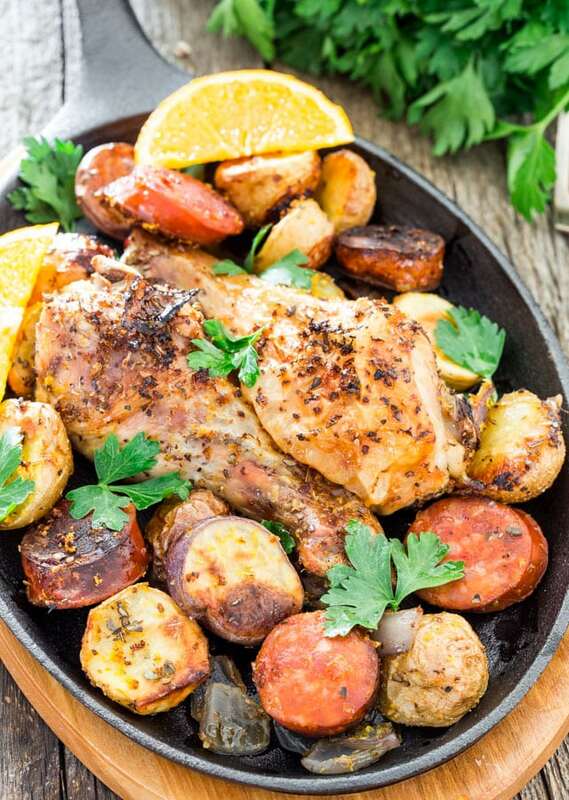 Spanish Chicken with Chorizo and Potatoes – an easy dinner that you can prepare in under 10 minutes. Chicken drumsticks, spicy chorizo sausage and new potatoes, it’s amazing! You know those nights when you come home from work, you’re so tired and brain dead you can barely manage to change your clothes? Well I’ve got the perfect dinner for you, specifically for one of those nights. There’s virtually no prep work, all you need to do is season the drumsticks and potatoes, chop an onion and zest a couple oranges. Can you handle that? I think you can! I’ve had many of those kind of nights, trust you me. Nights where I’ve been so tired that I can’t even go to the grocery store to pick up some food. But you’re hungry, starving actually and you still need to eat something. Thankfully, hubs is always there for me and helps out. This is one of those dinners, not only can he handle like a pro, but is his specialty and more so loves to eat it. I mean what’s not to love when we’re talking chicken and potatoes. And sausage, let’s not forget the chorizo sausage. 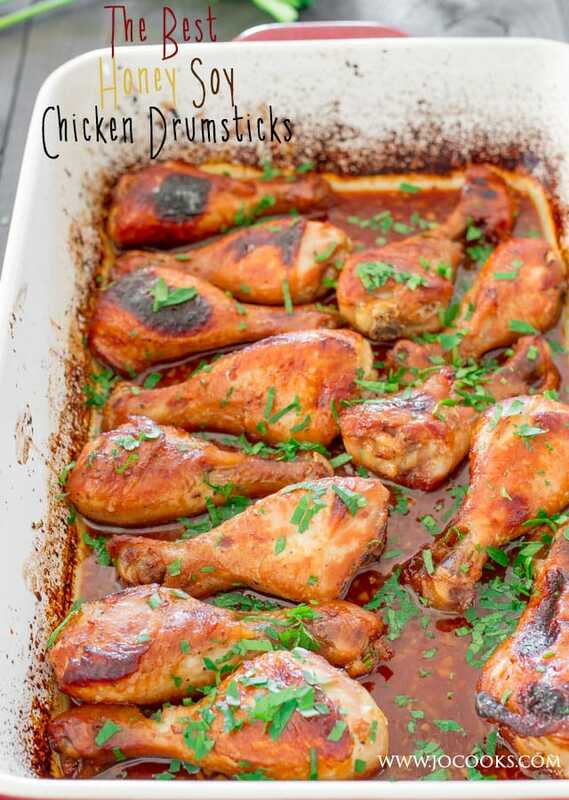 Basically all you need to do is in the morning take out the chicken drumsticks from the freezer to thaw them out during the day. For the potatoes, I buy these little bags of tri-colored new potatoes, which come in these small bags, I think it comes in a couple pounds a bag, and all I do is wash them and cut them in half. They are so delicious roasted and the great thing is they roast pretty quick too. I used some chorizo sausage here because you need a little spiciness in your life, and generously seasoned everything with salt, pepper and plenty of dried oregano. 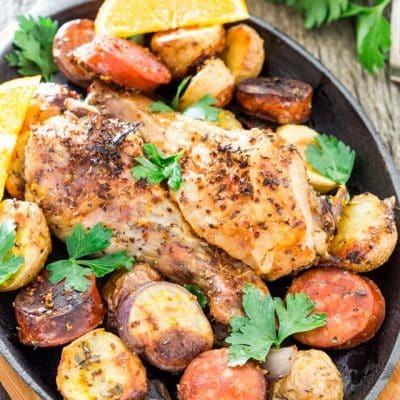 To get that nice citrus flavor just zest a couple oranges all over the chicken and potatoes and that’s it, the hard work is done. It bakes pretty quickly too because you bake it at 425, so it should be done in 45 minutes, though you will want to check your chicken and make sure it’s no longer pink inside. And that’s all she wrote. You got yourself one awesome, pretty cheap, and yummy dinner for you and your family. If you’re lucky, you might have some leftovers too! 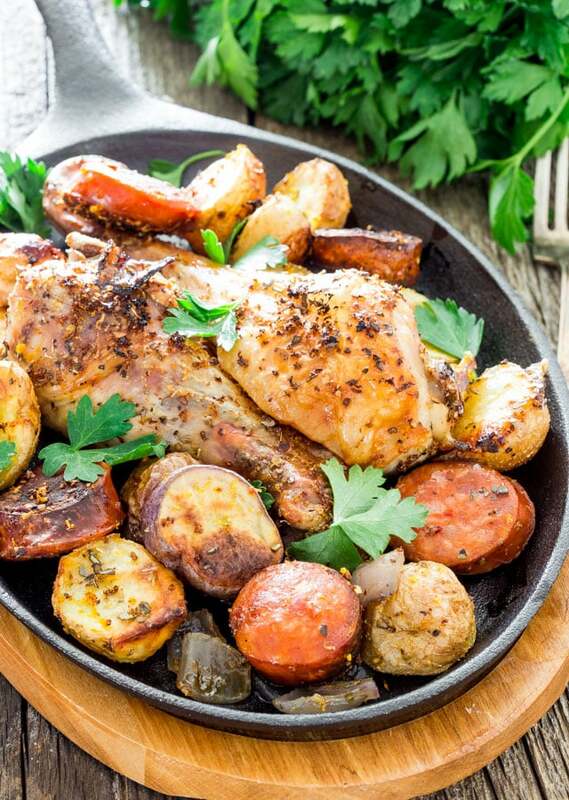 Spanish Chicken with Chorizo and Potatoes - an easy dinner that you can prepare in under 10 minutes. 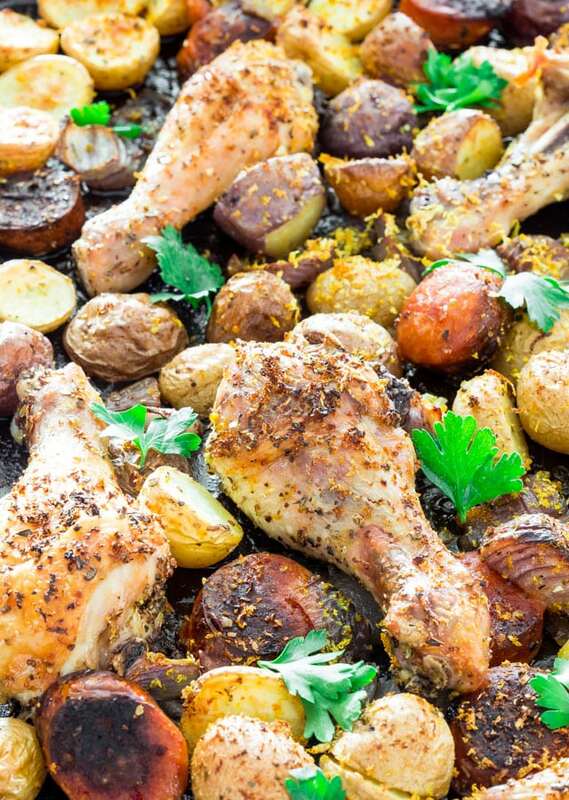 Chicken drumsticks, spicy chorizo sausage and new potatoes, it's amazing! 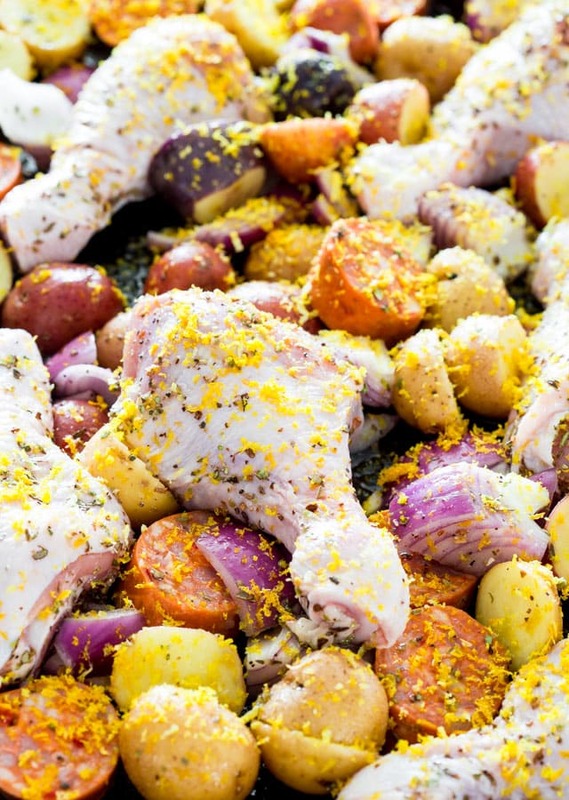 Toss all ingredients together in a big bowl then spread them out onto a baking sheet. 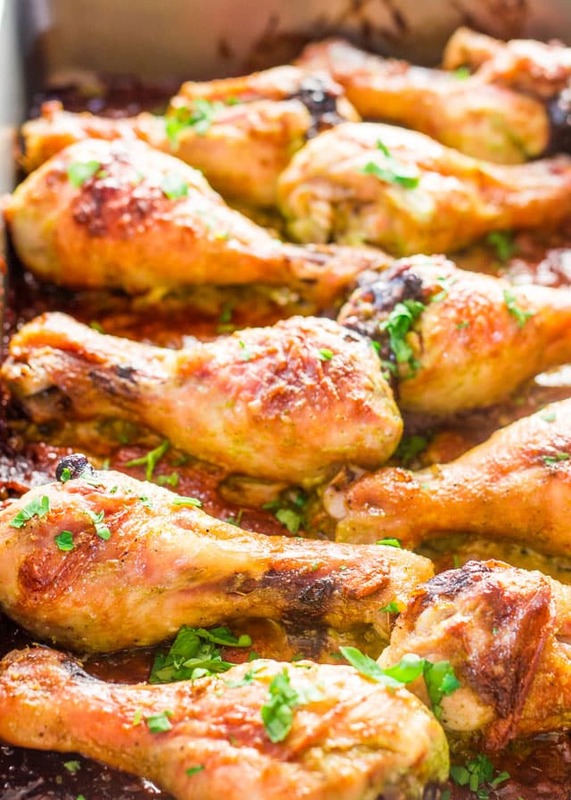 Bake for 45 minutes to an hour or until chicken is completely cooked through. Learning online Cooking is really not Easy, but some blogs put so clear Recipe which works easily, Thank you, man and keep blogging. Thank you and hopefully you try some out. EVERY recipe looks and sounds really DELICIOUS….. I THINK ALL ARE WORTH TRYING AND I JUST MIGHT HAVE TO DO SO…. Made this two days ago and the favors are so good. My husband loved the taste of the potatoes too! Just made this—YUMMY! I was a bit skeptical of this recipe before making it b/c 1) it seems so darn easy and 2) is not like anything I have ever eaten before. But boy, I was happily shocked, it is Delicious!!! Absolutely loved it. I added extra potatoes and used 9 oz of ground chorizo. I also used some of the juice of the orange on my chicken. Super yum. So glad you liked this Jennifer! I make this a lot but add a can of diced, seasoned tomatoes to it. Sooooo Good. 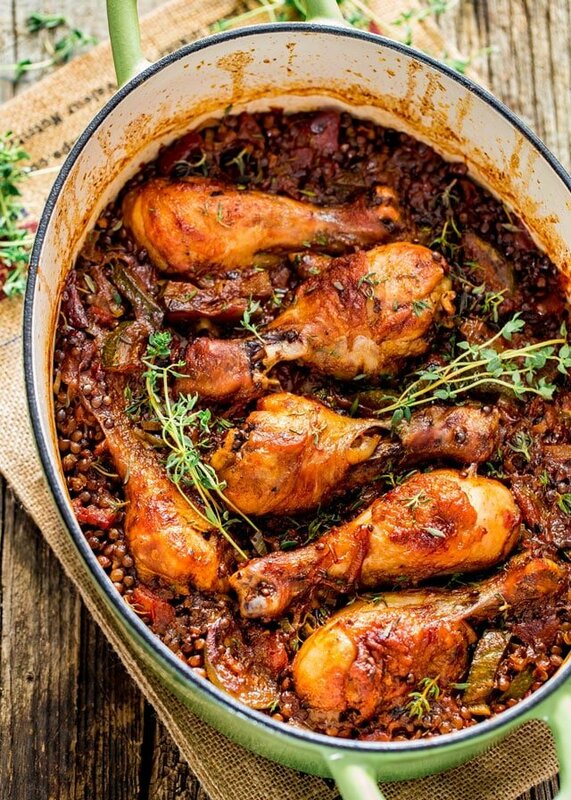 I’m loving all of your one pot/one skillet/one pan dishes…. PERFECT for those lazy week nights. Chicken and Chorizo! Sounds delicious and I will add it to my to do list. Me too Nagi, love her! I have those type of nights at least once a week. I work two jobs and barely have any me time. Don’t get me wrong, I like to be in the kitchen, too, but sometimes I need a break. I like how easy this dish is. I’m not a red meat eater, but I could totally substitute some spicy chicken sausage in for the chorizo. Absolutely, and you can add some other veggies too, sometimes we add bell peppers and tomatoes, the best! What an easy, incredibly delicious meal. I can taste all those flavors in my mouth just looking at the gorgeous photos.